Purpose: In this tutorial you will learn how to visualize Kohn-Sham states (orbitals) with exciting. Before starting, be sure that relevant environment variables are already defined as specified in How to set environment variables for tutorials scripts. Here, you can find a list of the scripts which are relevant for this tutorial, with a short description. Requirements: Bash shell and lxml library. 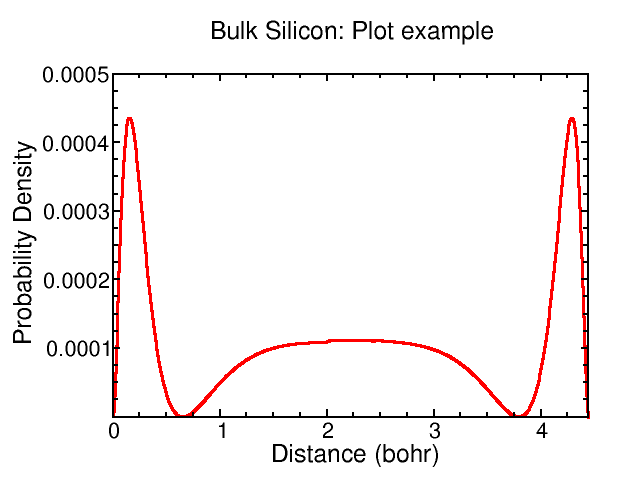 In this example, we calculate and visualize the probability density of the highest occupied Kohn-Sham (KS) state at the Γ point of the electronic bandstructure of bulk silicon. To this end, we start by creating a working directory KS-silicon and we move inside it. Here, we create an exciting (xml) input file called input.xml corresponding to a ground-state (GS) calculation for bulk silicon, which should appear as the one below. To start the calculation, you may run the script EXECUTE-single.sh. After you have completed the ground-state run, move to the directory test-GS, where the results are stored. In the above case, e.g., the k-point of the KS state is the one in position 1 in the list of k-points reported inside the file KPOINTS.OUT. Furthermore, the band index 4 corresponds to the highest occupied KS state at the k-point specified by the first index in the element pointstatepair. This can be verified by direct inspection of the file EIGVAL.OUT. The next important element is plot3d, which defines the space region where the KS has to be calculated. The additional element box is specified by the attribute grid, which defines the quality of the plot: The larger number of points in this mesh, the more resolved the resulting plot. Be aware that the increase of the number of grid points impacts on the computational costs! By means of the other elements origin and point one sets, respectively, the origin and the vectors, expressed in lattice coordinates, defining the space region where the wavefunction is calculated. This time the execution of exciting will produce as a result the wavefunction of the investigated KS state, stored inside the file WF3D.xml. The file WF3D.xml contains all information necessary for the visualization of the valence-band-top KS state. In order to visualize this state, you have to convert the WF3D.xml file to the xsf format. The resulting file PLOT3D-1-4.xsf (the labels 1 and 4 identify the KS state) can be visualized using standard tools like XCrySDen or VESTA. Now, a XCrySDen window will appear on the screen, showing the atomic structure, which in this example is the bulk silicon. In the middle of the left column a box appears, indicating Minimum grid value, Maximum grid value, and Isovalue next to an empty box. In this box the user has to type the isovalue with which the isosurface is to be plotted. As a rule of a thumb, 10% of the Maximum grid value is a reasonable value. Type the isovalue (e.g., 0.00002 in this case) and press the Submit button on the bottom right of the window. The isosurface representing the KS state will now appear on the main window. An example for the resulting image is the following (obtained using XCrySDen). When the plot2d element is specified, the grid is defined inside a parallelogram. To ensure a well resolved visualization, 200 grid points per direction are chosen here. We place the coordinate of the origin in (0, 0, 0), which coincides with the position of one of the two atoms in the unit cell of bulk silicon. Finally, we project the KS state on a rectangular plane, including on opposite vertices the two atoms in the unit cells, which is spanned by the vectors (1/4, 1/4, -1/4) and (0, 0, 1/2). finally, rotate around the y axis by pressing the button ROT -Y on the right column of the XCrySDen main window, until the x and y arrows of the coordinate system overlap completely. 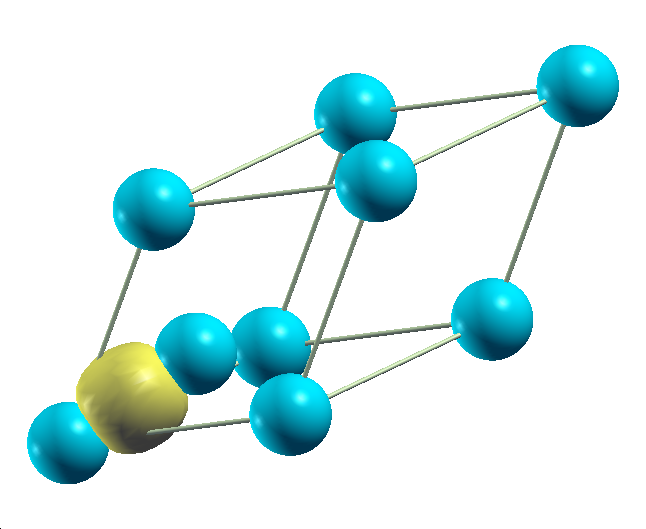 This plot represents a projection of the highest occupied KS state, already visualized as a 3D isosurface in the previous section, on a plane containing the two inequivalent atoms in the unit cell. The red region in the middle of the plot indicates the localization of the probability density of the highest occupied KS state along the bond between the two Si atoms. Notice that an intense region of probability density for this state can be observed in the vicinity of the atoms themselves, which are placed at the bottom right and top left vertices of the visualized plane. A similar block is present also in the input file for band-structure calculations (see Electronic-structure calculations). Inside the element plot1d two or more points are indicated, in order to define the path along which the desired quantity (in the case the probability density of the highest occupied KS state at Γ) is plotted. Since we are interested in visualizing such probability density along the bond between the two atoms in the unit cell, we assign to the element point the coordinates of the atoms, represented here in lattice units: (0, 0, 0) and (1/4, 1/4, 1/4)). Furthermore, we choose 1000 steps in the path subelement to ensure a good resolution. In this plot, the abscissa indicates the distance along the bond from the atom sitting at the origin. Pay attention that this distance is expressed in Bohr. In the y axis, the probability density of the plotted wave function is indicated. We notice the distribution of the highest occupied KS state along the bond between the atoms. 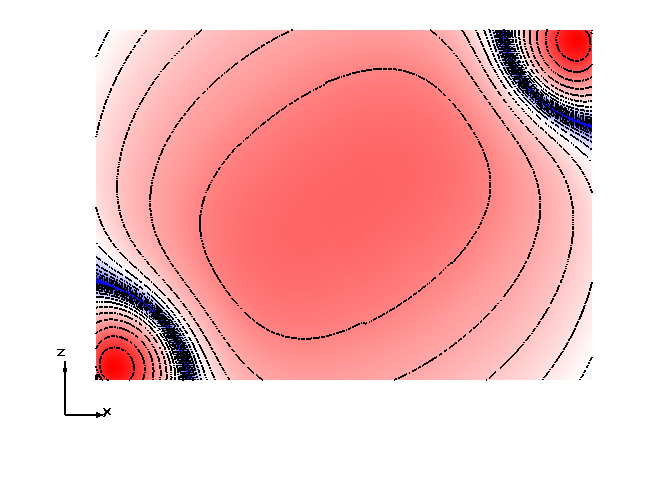 This corresponds exactly to the isosurface and to the contour plot visualized, respectively, as 3D and 2D plots in the previous sections. Visualize a different KS state. Use 1D, 2D, and 3D visualization tools. For the example presented in this tutorial, calculate and visualize some of the physical properties reported in the above table. For further details on each properties explore Input Reference. The visualization of the desity of states (DOS) and of the electronic bandstructure of a crystal is discussed in Electronic-structure calculations. In the last section of How to run calculations for simple molecules you can learn how to calculate and visualize molecular orbitals, with explicit application to the HOMO and LUMO states. In the application tutorial Fermi surface plot you can learn how to calculate and visualize the Fermi surface for metallic systems. Many other specific visualization scripts are used in the other exciting Tutorials.